LONDON — London's outgoing mayor Boris Johnson has launched a rant against Barack Obama calling his intervention in the debate about the European Union referendum "incoherent" and "hypocritical". In a column for The Sun, Johnson claims that when the U.S. president moved into the White House, a bust of Winston Churchill that had been there for years vanished. Citing the possible reasons for the disappearance, the mayor says: "Some said it was a snub to Britain. Some said it was a symbol of the part-Kenyan President's ancestral dislike of the British empire – of which Churchill had been such a fervent defender." However, there's still a Churchill bust in the White House. The White House has had one since the 1960s. At the start of George W. Bush's administration the then Prime Minister Tony Blair lent him a bust matching the one in the White House, which was being worked on at the time and was later returned to the residence. The version (Johnson references) was lent by Blair and was displayed by Bush until the end of his term, according to the White House. When a president's time in the White House comes to an end it's common place for the art loaned to them for the Oval Office to be returned, they said in a 2012 statement. 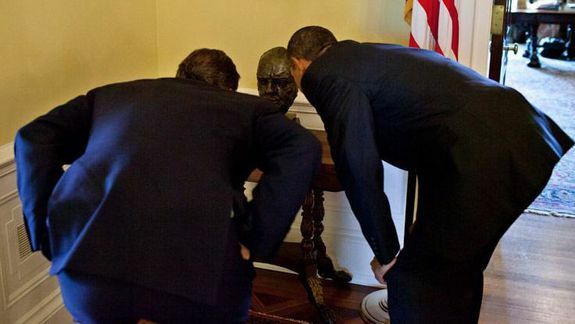 Here's a 2010 photo of Prime Minister David Cameron and Obama inspecting the Churchill bust in the White House residence. Official photo from the White House in 2010. For some people on Twitter, the tone of the sentence reminded them of Republican presidential hopeful Donald Trump. 'Part Kenyan'. Some grotesque innuendo from Boris there. He really is appalling. Conservative MP Sir Nicholas Soames, grandson of Winston Churchill, described Boris Johnson's column as "appalling." Diane Abbott, the shadow international development secretary, said Johnson's language "reflects the worst Tea Party rhetoric", according to The Guardian. "Many people will find Boris Johnson's loaded attack on President Obama's sincerity deeply offensive. If this is an illustration of the kind of diplomacy that we might expect from a Johnson leadership of the Tory Party then heaven help us. In truth this attack constitutes an unacceptable smear." UPDATE: April 22, 2016, 4:04 p.m. BST UKIP leader Nigel Farage endorsed Boris Johnson's comments telling the BBC: "I think Obama, because of his grandfather, and Kenya and colonialisation, I think Obama bears a bit of a grudge against his country." Bernie Sanders meets with Pope Francis. For five minutes.